There are a few different things to consider when purchasing new ceramic dinnerware or bakeware, and I’ve also included some use and care advice to help you out. Ceramics can be expensive, and usually the inexpensive ones will end up needing to be replaced constantly, so I’m a believer in spending more for better quality and that it will actually last a lifetime. 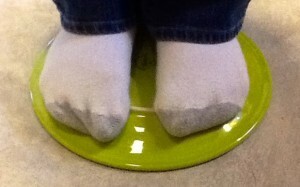 This is me standing on a Fiesta dinner plate as demonstrated to me by the Fiesta rep I met once. 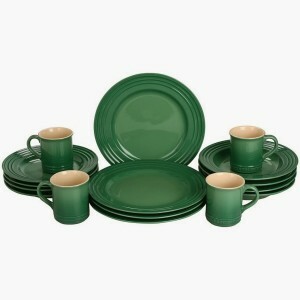 As mentioned in the “Ceramic Dinnerware and Bakeware Basics” blog, durability comes from how the ceramic is made. Depending on how many times the piece was fired during its creation is a huge factor – the less (at higher temps) is better. off easily; super glue did the trick since I don’t eat off of it. What also matters is the design – having thin edges or connecting pieces might be an indicator that it will chip. Imagine the piece lightly bumping into another piece in your dishwasher – edge to edge. Do you think it would stand up in this situation, or crack? The less edges the piece has the better, too. 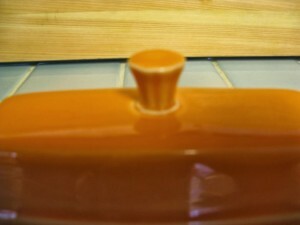 Bowls are a great example of this – does the base of the piece have a protruding edge? Just something else that could get chipped. Click here to watch my Ceramic Edge Test video. Colors can be fun until you put food on them, then all of a sudden the fun colors make your food look not so appetizing. I have a friend who gave up a cobalt blue loaf pan simply because she made mac and cheese in it and it looked inedible to her! There’s a reason why restaurants use whiteware; there’s also a reason why food judges always rate chefs on their “plating” – this is taught in culinary school, I kid you not! Also to consider with color is what scratching will look like (see more about scratching on ceramic below). Cobalt blue is notorious for showing marks very well and customers were always returning it with complaints. 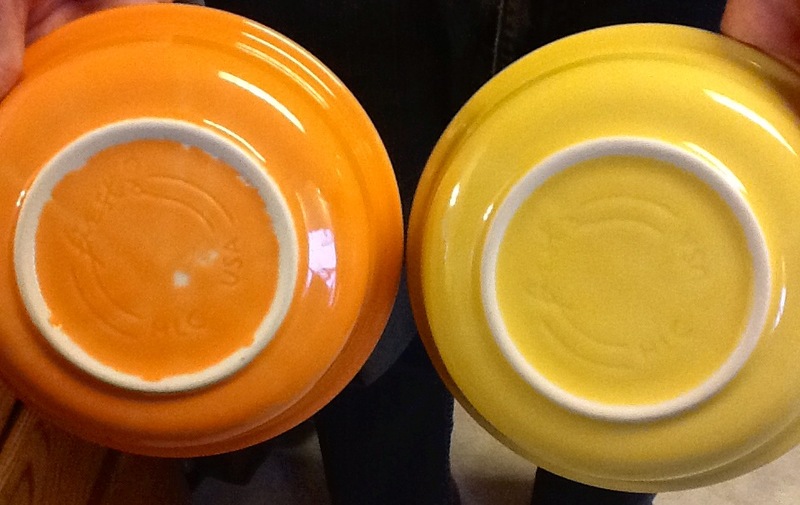 I have the “Sunflower” color in Fiesta dinnerware, and while all of the different colored plates show a small amount of scratching, the yellow really looks unappealing. You want to do some research and make sure the brand you choose is going to be around for a long time, producing the same product lines, and also the same color choices, otherwise you won’t be able to replace or add to your collection in the future. Fiesta dinnerware actually claim they never discontinue pieces because the pattern has remained the same for decades, only the colors have changed (or rather, “retired“). This might not make a person who buys all one color happy if their color gets discontinued!! You should be able to find information on at least quality vendors about when a pattern came out or how often they discontinue colors, etc. if you do enough research. Read about individual ceramic and glass brand names. 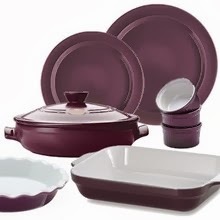 Make sure to check to see if the dinnerware or bakeware you’re selecting is dishwasher and microwave safe. Generally all ceramics are, however, the claim that it is safe for the dishwasher doesn’t mean it’s safe FROM your dishwasher. I load all of my ceramic bowls with dishwasher-safe plastic pieces in between them to avoid them bumping each other while being cleaned. I also find that if a piece of bakeware has buildup on it, just like cookware, it’s probably just going to get baked on harder inside of the dishwasher and not come out clean. As mentioned in the “Basics” blog, different elements exist within different color dyes that are used on ceramics. Different elements react differently when heated in a microwave; for instance, reds get hotter than any other color because of the lead contained in the glaze. It’s not harmful to you as a user, but it does react to the heat! Not all ceramics can handle the same temperature ranges, so be sure to check the instructions or label of the piece in question. You can really only assume bakeware is good to 350 degrees Fahrenheit; anything higher you would want to be sure you check first. Some of the sturdier brands go as high as 480 degrees, but I’ve never seen one that is OK to use on “broil”. 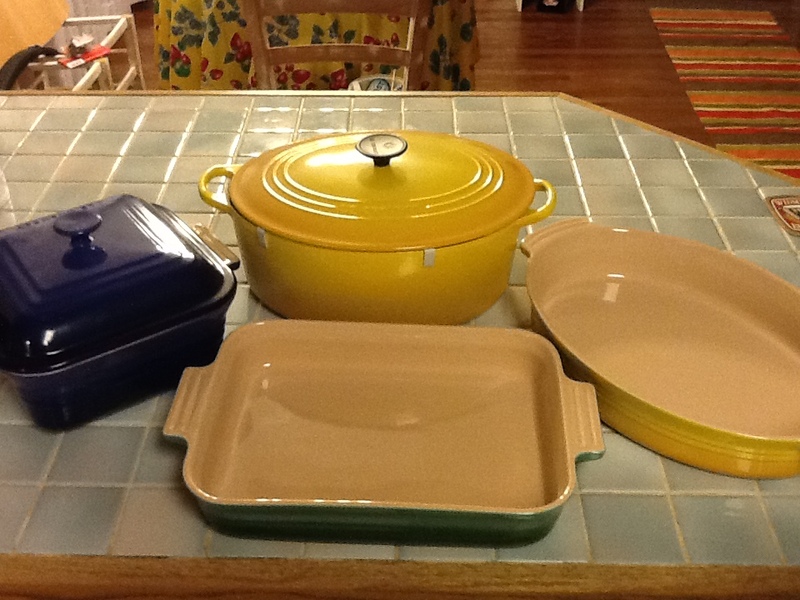 Le Creuset cast iron oven and three different bakers. Don’t mix them up and put the bakeware on the stove! Be wary of Pinterest recipes and other things you read online. Like with anything you read on the internet, not everyone’s an expert. (Not even me! I double-check myself constantly and will always update my blogs accordingly, however.) Two different casserole recipes I randomly found on Pinterest and tried asked me to put in my “oven safe” bakeware and then crank them up to 500 or broil and told me not to worry, it was fine. Luckily both times I realized my stupidity and turned the oven back down quickly enough. When an item says it is “freezer to oven” safe, they mean they want you to warm it up with the oven. Don’t EVER put cold ceramic in a hot oven, let them come to temperature together! (Same goes for a pizza stone!) Extreme temperature changes are a major cause of cracking and crazing with ceramics. Scratching on ceramic is normally caused by two different things. 1. Flatware scratching: This is inevitable unless you do all of your cutting on a different surface. 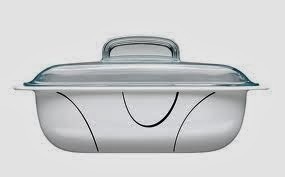 The metal from your flatware leaves unsightly marks on lighter colored porcelain and ceramics. There are various cleaning products you can purchase that they say will remove these marks, but I have never personally tried any of them. 2. Ceramic-on-ceramic scratching: This occurs when you stack your ceramics, more commonly with plates. Generally the base of a piece of ceramic has a ring that is not glazed and also a little rough to the touch. When you pull one dish out, it lightly scrapes against the other item it’s stacked against, causing a scratch. These scratches can actually be deeper and worse than flatware scratches. 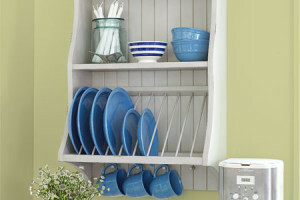 Ceramic-on-ceramic scratching can be avoided by purchasing ceramics with less edging, sanding down your unfinished edges, or storing them in a plate rack versus stacking them. 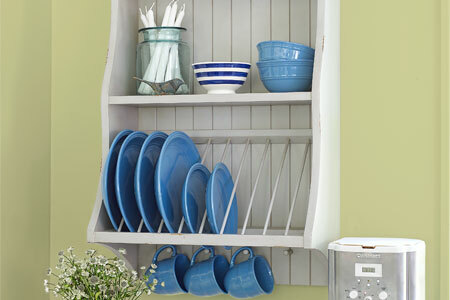 Plate rack storage to avoid surface scratching. I created a guide for you, which includes a quick video on how to sand your ceramics without sandpaper, using other pieces of dinnerware. You can also use a lower number grit sandpaper. Check out How to Sand Your Ceramic Dishes and Bakeware by Your Ultimate Kitchen on Snapguide. You can use the bottom of two similar-sized pieces to sand each other.